Tap a new market with "Buzz" ! With our original consumer database and A.I. technology, we develop original branding "Made in Japan" products for huge Asian market including China. ﻿﻿2017/01/31 BuzzCommerce established Buzz Commerce Japan Inc. in Roppongi, Tokyo. We serve better and speedy services for both our suppliers and buyers. ﻿﻿2016/07/1 BuzzCommerce supports National Science and Technology department (NSTDA) Thailand to promote Thai SME farmer's innovation products (Organic products and cosmetics) in Taiwan / China. ﻿﻿2015/2/1 Our Media E-Commerce Saroop.net reached 6 Million Page View / month. ﻿﻿2015/2/1 Our Saroop Facebook fans reached 600,000 fans. 2014/10/28 Media E-Commerce system "Saroop" using GMO Global Payment gateway to offer multiple payment options for Thai local users. ﻿﻿2014/7/1 Our curation media for Thai women, Saroop.net, reached 200,000 fans on its Facebook page. ﻿﻿2014/6/30﻿﻿ Our curation media for Thai women, Saroop.net, reached 1 million Page View / month. ﻿﻿2014/5﻿/28 Shinsuke Wakai, Founder and CEO, is on thebridge.jp, the leading Japanese startup media. "Meet the Japanese entrepreneur trying to disrupt the Thai cosmetics market"
﻿﻿2014/5﻿/14﻿﻿ Buzz Commerce is on TechInAsia: "50 startups in Asia that caught our eye". BuzzCommerce is 2nd on the list. 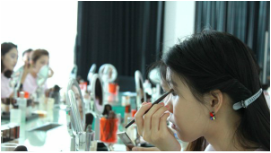 ﻿﻿2014/5﻿/6﻿﻿ Buzz Commerce is on TechInAsia: "Thai women crave Japanese cosmetics, and BuzzCommerce wants to satisfy them". ﻿2014/5/6﻿ Buzz Commerce is on e27 : "Thailand’s BuzzCommerce to debut after receiving seed money from East Ventures". ﻿2014/5/6﻿ Received seed round investment led by East Ventures. East Ventures is leading seed - early stage tech VC in Japan, Indonesia, and other South East Asian Counties. Batara Eto and Willson Cuaca, managing partners of East Ventures, joined BuzzCommerce as regional advisors. ﻿2014/4/6﻿ Buzz Commerce Pte Ltd incorporated by Shinsuke Wakai. ﻿2013/12/15 Shinsuke Wakai, Founder & CEO, commented at NHK, Japanese national public broadcasting organization, Bangkok office as a specialist in cosmetics and beauty industry in Thailand.